Honda has launched the X-Blade ABS for Rs 87,776 (ex-showroom Delhi). This is the same single-channel ABS unit found on the Honda CB Hornet 160R. The ABS variant costs Rs 8,008 more than the standard variant. Along with the safety update, Honda is now offering accessories like a belly pan fairing, front fork covers and wheel rim tapes as standard with the new variant. It goes up against the Suzuki Gixxer ABS and the Honda Xtreme Sports. Honda XBlade prices start at Rs. 80,007 (Ex-Showroom). Honda XBlade is available in 2 variants and 5 colours. Share your experiences with XBlade? Q. Is Hornet have better performance than Xblade? Q. Which one Shall I choose B/w Honda XBlade & Pulsar 150 DTSI? Q. You guys says service period is 6000 km for Honda Xblade. Can we use the engine oil for 6000 km without replacing. Q. Unicorn 150 ABS or X Blade ABS which is a best? 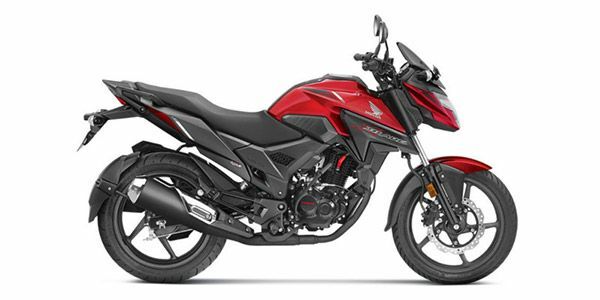 Honda’s latest entrant in the rather crowded 160cc space certainly looks the sharpest, but the specifications are more in line with a daily commuter. Does this formula make it suffer an identity crisis, or has Honda managed to cook up a unique recipe? The Honda X-Blade is a sharper and more chiseled version of the Honda Hornet, with muscular fuel tank extensions, a dual outlet muffler and a unique headlamp design. It gets a digital instrument cluster and LED lighting for both the headlamp and the tail lamp. There’s a single-piece seat on the X-Blade that’s slightly longer than the one seen on the Hornet. A rear disc brake is not available even as an option and neither is ABS. The Honda X-Blade shares its motor with the Hornet 160R. But the 162.71cc, air-cooled, single-cylinder engine puts out 14PS of power at 8500rpm and 13.9Nm of torque at 6000rpm, which is 1.5PS and 1Nm less than the Hornet 160R. The motor is mated to a 5-speed gearbox. The X-Blade gets a diamond-type frame suspended on telescopic forks up front and a monoshock at the rear. Braking duties are handled by a 276mm front disc and a 130mm rear drum brake. It is equipped with a 12-litre fuel tank and tips the scale at 140kg (kerb). Suzuki Gixxer: The engine and the bike’s handling have been developed under the watchful eyes of the same designers who have also produced the Suzuki GSX-R series. This is a worthy city-based sporty 155cc bike, with distinct design and enviable refinement. Yamaha FZ-S V2.0: The V2.0 delivers on style, build quality, refinement and handling. It is also the only bike in the segment to get fuel-injection, but that puts it on the top in terms of pricing. That said, it is a strong performer and is a proper upgrade to the previous version. Bajaj Pulsar NS 160: The Pulsar NS 160 ticks all the right boxes when it comes to style, performance, ride and handling, barring refinement. The new NS 160 is a worthy contender and makes a strong case for itself in this highly competitive 160cc segment. TVS Apache RTR 160 4V: Competitive pricing and performance are two key areas that need to be addressed to survive in this cut-throat segment and the Apache RTR 160 4V delivers well on both fronts with class-leading features. However, it doesn’t feel as confident as the Pulsar NS 160 or the Honda Hornet while braking. The X-Blade was a surprise launch by Honda and left us wondering about its existence next to the already successful Hornet 160R. Yes, the X-Blade looks a lot more appealing than the Hornet and the Unicorn 160, but we need to find out how the loss in power and torque figures has benefited the X-Blade. Until then, it's hard to put a finger on how Honda plans to position this product, especially with the existence of a more commuter friendly Unicorn 160 and the sporty Hornet. Honda CB Unicorn 160 vs X-Blade vs CB Hornet 160R: What To Choose? HMSI feels there’s a lot of potential in the 160cc segment. In fact, they have three motorcycles in the category. Read on to find which one suits you! Didn't show the clear mileage of my bike..? Sometimes it gives more sometimes it gives less..